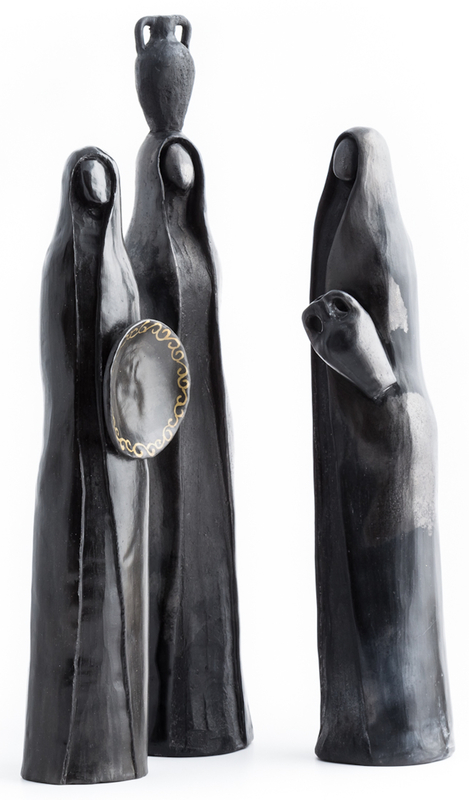 The proud Sardinian woman is the theme that inspires the black ceramic sculptures shaped and decorated by hand, providing variations and studies of the traditional female figure of Sardinia. 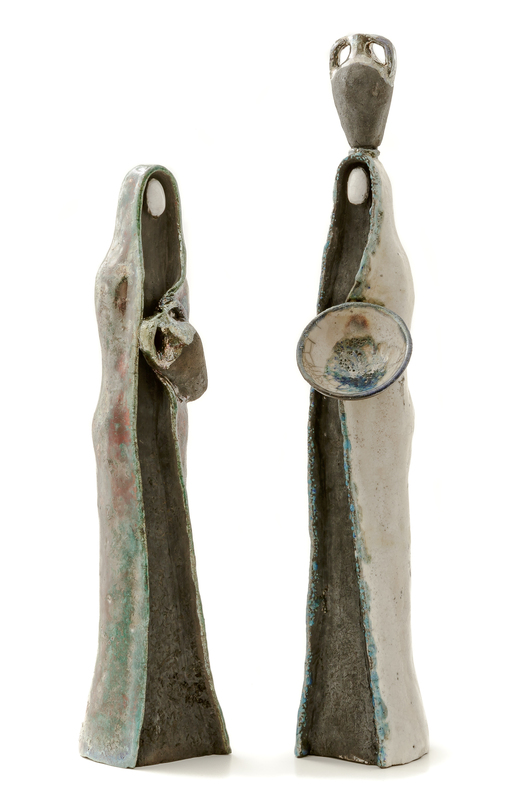 The slender female figures of these raku ceramic sculptures are originally realised in plastic form distinctive of the workshop, in elegant poses carrying the typical terracotta jugs and carrier baskets. 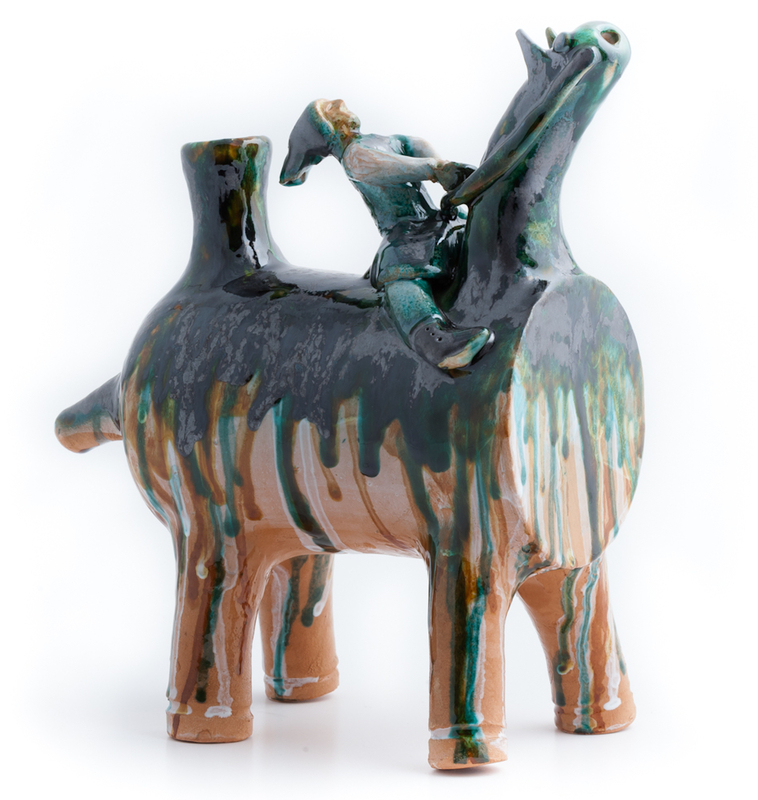 Cavallino, a decorative object inspired by an original manufact of traditional culture, is hand-crafted, painted and glazed. It is designed as an architectural decoration, usually installed on the roofs of the house until recent times, as a lucky charm and a sign of protection. Lucio and Silvia's studio, LS linearte, was founded in 2001 as a place to share experiences in the field of crafting, honed in years of study and experimentation in different artistic and ceramic techniques. Their work focuses on the investigation of local traditions, customs and practices, , in multiple forms, characteristic of the campidanese rural territory. Their references reinterpret the elements of local fauna, people, traditions, through expressive modalities of research and contemporary making. The workshop is a fascinating place, located in the old town of Serramanna in Sardinian Medio Campidano. Made in the campidanese fashion, with huge glass walls and low arches, it is the ideal context to see artisans at work and their productions. The work of potters stems from multiple inspirations. The decorative object collection called Pecora id dedicated to the Arbus country life, with its flocks and pastures. Stylized animals are a successful artistic elaboration that blend linear parts and descriptive decorations. 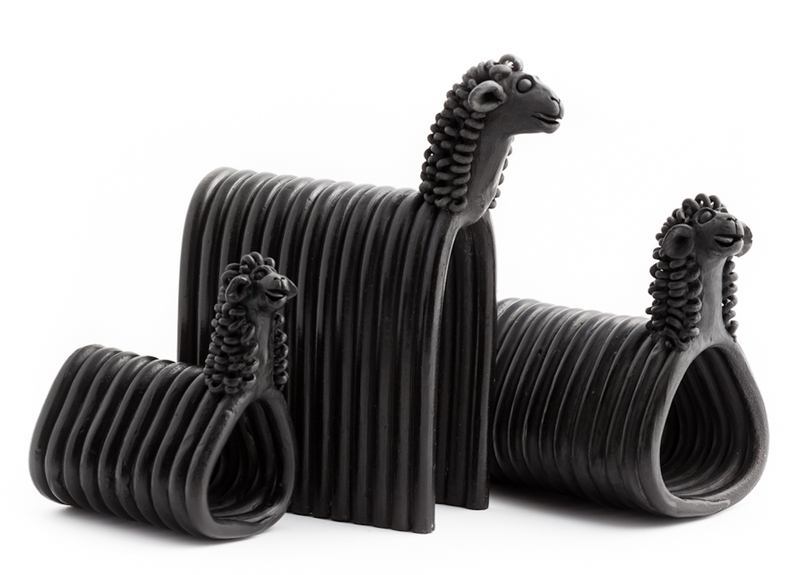 The Sardinian woman fair, a collection of black ceramic sculptures, analyses the female figure in local tradition. The Pintadera collection consists of black vases decorated with graffiti and moulds, while the Ciottole con inserto e cucite collection features containers with clean contemporary lines and ancient inspirations. Tratto distintivo è la produzione di ceramiche nere, realizzate con la tecnica del bucchero, alla quali accostano ceramiche smaltate ed invetriate. I ceramisti utilizzano tecniche di formatura a lastre, formatura manuale e formatura al tornio, combinate con tecniche decorative differenziate in funzioni alle diverse ricerche stilistiche.